As with many constellations, Lyra has a variety of legends that describe its colorful past. The earliest incarnation of Lyra dates back to the middle eastern civilizations that identified this constellation as a vulture. The brightest star in Lyra is called Vega, which is Arabic for Vulture. The ancient Greeks, however, identified this constellation as a harp. And while a harp my not seem like the most exciting object to place in the sky by the Gods, the legend of Lyra is one of both love and tragedy. The most famous story is that between two lovers, Orpheus and Eurydice. Orpheus was a legendary musician and poet in Greek mythology, and he had the ability to charm all animals, gods and humans with his mystical harp. On the day that Orpheus and Eurydice were wed, he played his lyre for his new wife, and while she danced in the meadow, she fell into a nest of vipers. Another version of the story states that she was chased by a saytr, causing her to fall. Either way, She suffered a fatal bite on her heel and died instantly. Her body was found by Orpheus, and he was so devastated by the loss that he expressed his sorrow through his song. As he played his lyre, the Gods and nymphs were so moved that they encouraged him to travel to the underworld to retrieve his beloved. As Orpheus played his harp, he enchanted and softened both Hades and Persephone, the God and Goddess of the Underworld, and they agreed to release Eurydice. But there was a catch, Orpheus had to agree to not look at her until they both passed into the upper world. As he guided Eurydice through the underworld, he began to doubt the she was really there, which was a trick of deceiving Hades. And just as they reached the threshold, Orpheus turned to look at his wife before she stepped into the sun, and she disappeared forever. She went back to the underworld and Orpheus lost this love once again. In death Orpheus was reunited with Eurydice in the underworld, and Zeus, moved by the tragedy, placed the harp of Orpheus in the sky to honor the love between the doomed couple. Now the constellation Lyra is a fairly easy one to point out, because it has the bright star Vega. It is also part of the asterism known as the SUMMER TRIANGLE. View the diagram to see the summer triangle and the stars and constellations that are a part of it. If you can see these bright stars during the summer, you should be able to find Lyra. 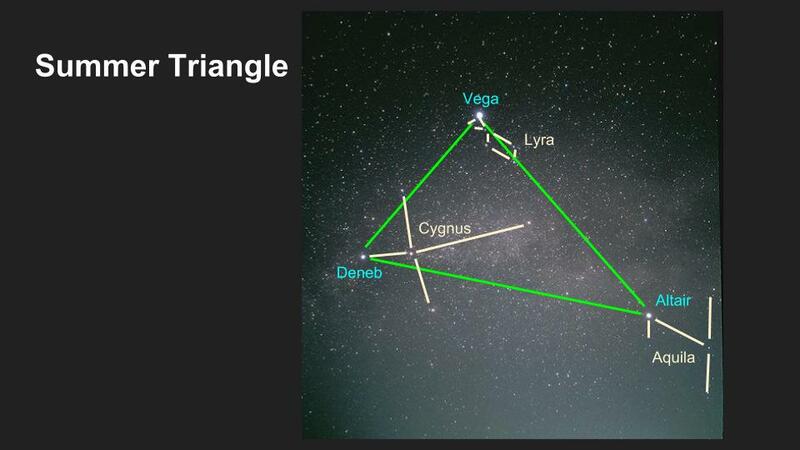 Vega is the brightest star of the summer triangle. Use this video to help you find the constellation Lyra and practice finding its shape and bright star of Vega.